The Caspian 8-ft x 10-ft Rectangular Market Umbrella provides a large shade area for your patio space, perfect for oval and rectangular tables. The push-button tilt adds longevity to your umbrella by separating the tilt feature from the handy open/close crank feature. Simply crank open the canopy and push a button to tilt the canopy to obtain your desired shade. The strong anodized-aluminum pole and 8-rib canopy structure are elegantly finished in a rust-resistant powder-coated bronze color. The durable weather and fade resistant Olefin fabric canopy sports a single wind vent that allows air to escape freely to limit wind damage. The Caspian is beautiful, stylish, and built to last! Olefin fabric canopy backed by 2 year warranty; 3 year warranty on pole and structure. 80-lb base recommended (sold separately). Escape the hot summer sun in colourful style with this 9 ft. Aluminum Market Patio Umbrella. Featuring a sturdy, rust-resistant aluminum frame with powder-coated finish, this Yellow canopy is fade-resistant outdoor fabric designed to withstand the elements. Easy to open and close with a crank and tilt mechanism allowing you to move the umbrella to be repositioned to provide shade throughout the day. Included is a carry bag for easy transportation allowing you to bring it with you on all of your outdoor living adventures! This 9 FT Market Umbrella is constructed using a powder coated, rust proof aluminum frame. It is equipped with 8 ribs for added support and features a crank and tilt system. It comes with a carry bag for easy transportation allowing you to bring it with you on all of your outdoor living adventures! Enjoy the outdoors with this 9 foot market umbrella. This umbrella has an aluminum frame with steel ribs. With tilt and crank. Polyester cover in navy blue color. 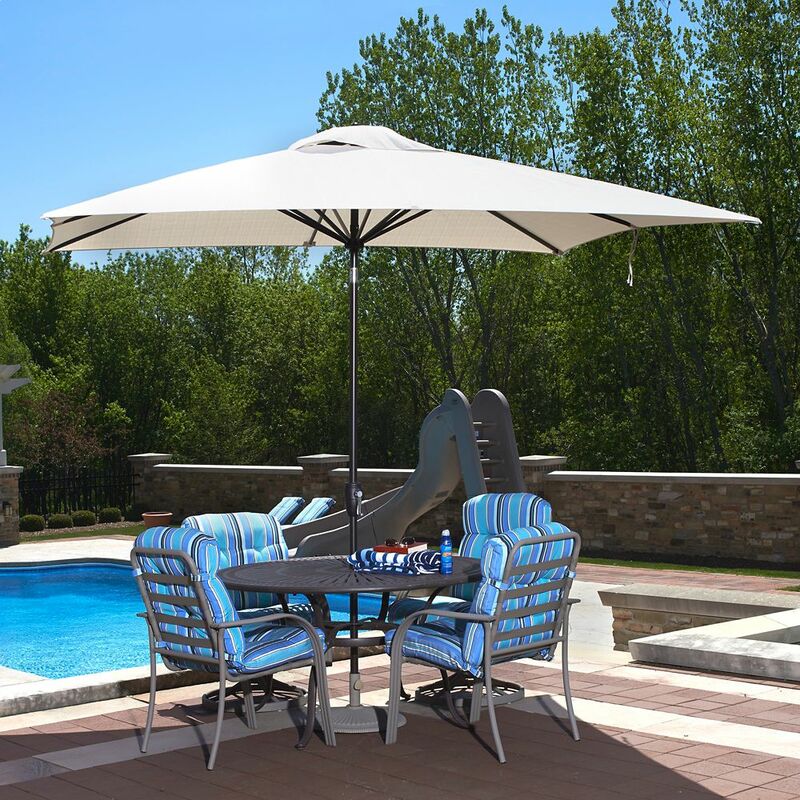 The Adriatic 6.5-ft x 10-ft Rectangular Market Umbrella provides a smart and stylish way to shade your oval tables all summer long. This umbrella is designed for easy operation. Simply turn the crank handle until the canopy is completely open, and then continue cranking to automatically tilt the canopy to obtain your desired shade. The durable anodized-aluminum, rust-resistant pole with the convenient auto-tilt feature has a rich bronze-colored finish. The 6-rib canopy, covered in weather and fade-resistant Olefin fabric, sports a single wind vent that allows air to escape freely and limits wind damage. Olefin fabric canopy backed by 2 year warranty; 3 year warranty on pole and structure. 50-lb base recommended (sold separately). Caspian 8 ft. x 10 ft. Rectangular Market Umbrella in Champagne Olefin The Caspian 8-ft x 10-ft Rectangular Market Umbrella provides a large shade area for your patio space, perfect for oval and rectangular tables. The push-button tilt adds longevity to your umbrella by separating the tilt feature from the handy open/close crank feature. Simply crank open the canopy and push a button to tilt the canopy to obtain your desired shade. The strong anodized-aluminum pole and 8-rib canopy structure are elegantly finished in a rust-resistant powder-coated bronze color. The durable weather and fade resistant Olefin fabric canopy sports a single wind vent that allows air to escape freely to limit wind damage. The Caspian is beautiful, stylish, and built to last! Olefin fabric canopy backed by 2 year warranty; 3 year warranty on pole and structure. 80-lb base recommended (sold separately). Caspian 8 ft. x 10 ft. Rectangular Market Umbrella in Champagne Olefin is rated 3.5 out of 5 by 27. Rated 5 out of 5 by Susan from Perfect size for our four-seater patio set. Very well... Perfect size for our four-seater patio set. Very well made. Rated 5 out of 5 by HomeDepotCustomer from Easy to assemble, very pleased with it.... Easy to assemble, very pleased with it. Rated 4 out of 5 by Lester from Good quality.... Good quality. Rated 1 out of 5 by Patrick from Returned the first one when the cord broke while raising... Returned the first one when the cord broke while raising it.Returned the second umbrella because it bent over and snapped the pole immediately after I placed it in the base. I have a 75lb base under the table. The metal polest are thin and weak and cannot support the weight. Rated 1 out of 5 by VERYUNHAPPY from Put up with a 90 lb base and the pole was so flimsy it snapped within 30 minutes. I'm calling the... Put up with a 90 lb base and the pole was so flimsy it snapped within 30 minutes. I'm calling the company to see what they will do, but I'm not very hopeful...FURIOUS. Biggest waste of $200 ever! I'll keep you posted on what the company says.